Healthcare simulation may be an effective educational tool for acquiring difficult airway management skills, and has been shown to be more than adequate as an adjunct to traditional training in emergency airway surgeries. While it can be extremely troublesome to correctly perform airway surgery (also known as a cricothyrotomy, or a cricothyroidotomy), the procedure is nonetheless acknowledged by the medical community to be a reliable, and oftentimes necessary, life-saving maneuver. Proper training, however, is essential. Any miscalculation, or error in technique on the part of the healthcare provider could quickly result in a patient fatality. Emergency airway surgery involves cutting through the neck to penetrate the cricothyroid membrane of a patient whose normal breathing has been made difficult by trauma, an obstruction, or has been compromised in some other way. A surgeon will make incisions that are as precise as possible in order to facilitate oxygenation, prevent aspiration, and allow for positive pressure ventilation. 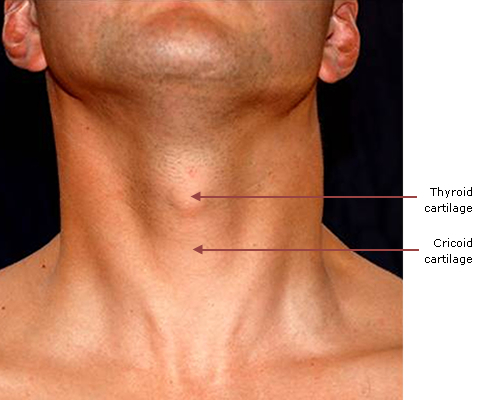 Problems may ensue if the location of the cricoid cartilage is misjudged, or if an incision is not large enough to allow a bougie to pass through and beyond the sternal notch to act as a guide for intubation. 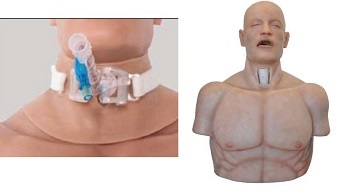 Typically, clinicians obtain skill in difficult airway cases by using the apprentice training model (competency is developed over time through mentoring and hands-on training with real patient cases). But what of the number of practitioners who encounter relatively few real-life airway emergencies? What happens to the patient who is suddenly placed under the care of a surgeon who has not received sufficient training in actual surgical airway procedures? Difficult airway management remains one of the most challenging tasks to master for surgeons and anesthesiologists. In fact, airway complications rank as a leading cause of death and a primary cause for permanent neurologic injury related to anesthesiology procedures. Standardized guidelines, risk-free methods for practice and immersive training protocols may be the best options for improving outcomes. Human patient simulation and simulation task trainers are viable alternatives to the practice of training on real patients. Simulation can provide anesthesia learners and surgical students with hyper-real experience in high-risk airway management events, with absolutely no immediate danger of injury to an a living person. With mounting evidence to support high-fidelity human patient simulation as a potentially ideal method for training in difficult airway management and emergency airway surgery, perhaps it is worth taking a closer look at healthcare simulation training for advancing patient safety and improving clinical competency. View surgical cutsuits, surgical airway training simulators, and more here.